Five Things About Teen Wolf 5x01, "Creatures of the Night"
Another thing Teen Wolf will apparently be doing this season: nonlinear storytelling. I mean, maybe we won’t see any more of the Eichen House Lydia bits. (That would be pretty much par for the course, given Teen Wolf’s penchant for introducing things, forgetting about them for seasons at a time, and then picking back up on them seemingly at random.) But whether it gets picked back up or not, flashforwards seem like a terrible idea for Teen Wolf, which has a hard enough time constructing a sensible narrative when everything’s going in the right direction. Despite the glowy-handed werewolf fight and the creepy Eichen House flashforwards… nothing happened in this episode. I sort of get the idea of taking an episode to “get the band back together,” especially in a season that is presumably about testing the longevity of friendship, but seriously, Kira spent half the episode sitting in a car. Teen Wolf episodes often end about halfway through whatever the hell story it is they’re trying to tell (see “Anchors” and “More Bad Than Good” from the beginning of season 3B), but it’s worth pointing out, because literally all Kira did was sit in a car. The most successful scene of the night, by far, was the Senior Scribe. It showcased all of Teen Wolf’s best qualities: its attention to detail in character work, its attention to continuity in backstory, and its occasional bursts of real, visceral emotion. Stiles lingers longest on his initials, thinking of those who have passed through the school before them, and what happened to them; Malia hesitates over which initials to use, a moment made more poignant by her adoptive father’s appearance earlier in the episode; Scott memorializes Allison alongside himself. Stiles’s pause at Derek Hale’s initials might be read as queerbaiting (though I go back and forth on the degree to which I think the show is doing that, and the degree to which I think they legitimately just have fun playing those two characters off each other) but it’s also a nod to a character who Teen Wolf could just as easily not have remembered. At a time when Stiles is remembering the past and worrying about his future, it makes a great deal of sense for him to think about the only friend he has who’s graduated high school, and it was a fairly seamless way to reference a character who was once a huge part of the show. Scott writing Allison’s initials is an even clearer example of Teen Wolf’s long memory. Teen Wolf takes a lot of flack for “forgetting” Allison, but she was a huge presence throughout all of season four, and the show actually deserves some praise for continuing to make her loss felt. A couple of years ago, I published an in-depth look at the gender make-up of British and American TV writing staffs, with a particular emphasis on sci-fi/fantasy shows. In that case, I was looking for data to justify yelling about Steven Moffat. Alas, the data did not bear me out on that one, so I was forced to yell about Steven Moffat for other reasons. Anyway, since then I've thought a lot about the kinds of entertainment questions that can be answered with publicly available data. It probably shouldn't have taken me two years to get from "gender disparity in writing staffs" to "gender disparity in showrunners," but in my defense, "Day of the Doctor" aired three months after that post, and the frothing rage it inspired sort of blasted everything else out of my mind. But I've now mostly recovered, so I decided to do a deep dive into the gender make-up of American showrunners. And as an extra-special Father's Day gift to my dad, who believes I would be the most popular blogger in the world if I would just cut down on the f-bombs, I will not swear a single time. I looked at every primetime, scripted show that aired on an American broadcast network (ABC, CBS, the CW, Fox, or NBC) in the 2014 - 15 season. This left out reality shows and soap operas. For each show, I recorded the names of its showrunner(s), whether it had at least one female showrunner, and whether it had at least one male showrunner. My data was gathered from Wikipedia and several dozen (probably over one hundred) interviews and news articles. Studies should have specific questions going in. 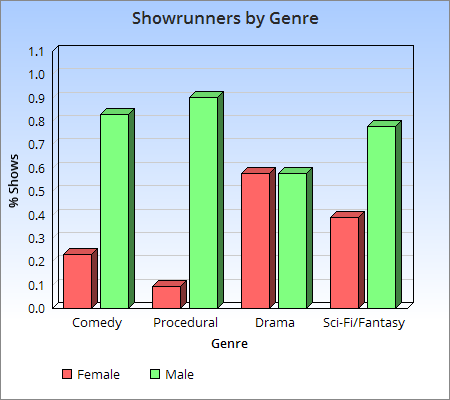 In keeping with the sci-fi/fantasy theme of my 2013 study, mine were: What percentage of American TV shows have at least one female showrunner? Are some networks more gender-equal than others? Are some genres more gender-equal than others? "Showrunner" is an uncredited role on American television productions. The showrunner, usually credited as an executive producer, is in charge of the day-to-day running of the show--as you might expect. This also generally makes them the ultimate authority on the creative direction of the show; they decide on long-term plotlines, assign and revise scripts, and incorporate notes from executives. Because most shows have numerous executive producers, figuring out which one is the showrunner when you are unfamiliar with the show can be a tricky business. Showrunners are often, but not always, the creator of the show. In the end, I just googled extensively. If a preponderance of news articles/interviews named a person as a showrunner, I went with that. I used a combination of names and publicly available photos to determine gender. This is not a 100% foolproof system, but it's the best I have. Edit: A concerned reader pointed out that my tables are less than clear. (Thanks, concerned reader!) To clarify: The second column in each table lists the number of shows in each category; the third column lists the number of shows with at least one female showrunner in each category; the fourth column lists the number of shows with at least one male showrunner in each category; and the final column lists the percentage of shows with at least one female showrunner (that is, female showrunner shows divided by total shows) in each category. The third and fourth columns may sum to more than the total number of shows, because some shows have more than one showrunner. Obviously, those aren't great numbers. Three times as many shows have a male showrunner as have a female showrunner, On the other hand, they're not unexpected numbers; in my 2013 writers room study, I found that the average American show had a writing staff that was 33.4 percent female. And the actual ratio--that is, the total number of credited female writers on American television, divided by the total number of credited writers--was .317, which is extraordinarily close to the showrunners number. In some ways, that's good news. TV writers' rooms act as a kind of training ground for showrunners; most showrunners have put in at least a few years writing for someone else's show before they're handed the reins of their own. If 31.7 percent of TV writers are female, and 30.1% of showrunners are female, that's an indication that showrunners are drawn with relative gender equality from the pool of qualified TV writers. Of course, that just means that the problem for women isn't getting out of the writers' room--it's getting into it. What About Those Network and Gender Questions? Right! Well, I'll start with genre. Right off the bat, you can see what I'm going to call our "problem genres": comedy and procedurals. Meanwhile, dramas are the best out of any genre, and do better than any individual network; they have total gender equality. Sci-fi/fantasy, my old frenemy, rides the fence; 38.9 percent of SFF shows have a female showrunner, which is juuuuuust above the average. The networks show a starker divide. ABC and The CW both have 50 percent or more of their shows with a female showrunner; all the other networks have less than 25 percent, with NBC showing an especially dismal 11.8 percent. Correlation is not, of course, causation, but if I had to hazard a guess, I'd say that the network numbers go a long way toward explaining the genre numbers. ABC and The CW, the two networks with the best gender equality, account for 13 of the 18 SFF shows, and they account for all of the SFF shows with a female showrunner. CBS, meanwhile, the second-worst network, accounts for 2/3 of all procedurals--the worst genre. Though it is possible, I suppose, that networks are first specializing in genres, and then the gender biases of the genres are determining the networks' make-up, the reverse seems more likely. But again, correlation is not causation. That SFF number is interesting to me, because back in 2013, SFF shows were also just slightly above the average in terms of female writers--but at the time, SFF shows were much more spread out among the five networks. 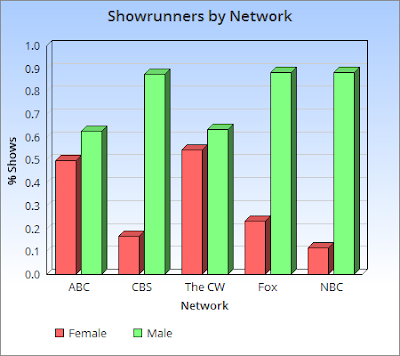 Also interesting: CBS has only two dramas, but those dramas both have female showrunners. And among procedurals, only CBS has any female showrunners. There are methods by which we might try to suss out the causation, but unfortunately, they rely on us having more data than we do. The fact that there are only two shows that are both dramas and on CBS makes it difficult to figure out how "drama" interacts with "CBS." Fine, fine, you can have conclusions. No matter what the causation, it's still a fact that ABC and The CW are doing better than the other networks in terms of gender equality. And it's a lot easier for a network--a defined entity with a relatively small number of decision-makers who regularly communicate--to enact purposeful change than it is for a genre to do so. So if we want more gender equality among showrunners, the thing to do seems to be to applaud ABC and The CW, both with words and with viewership. Make an effort to watch shows with female showrunners, and then write publicly about why you're doing so. Now, go out there and watch TV!